We’re half way April, so it’s time for my monthly post with inspiring blogger outfits again! All those springy outfit shots with lovely colours and open shoes are making me so happy! How about you?! I recently discovered the blog Nora Finds. Nora has a lovely vintage style and a gorgeous hat collection! She seems to have one to match every outfit! And I really like the colour combo Taria-ann from Frunette is wearing. I never thought of combining beige with electric blue, but it really looks smashing! All in all, I found some great inspiring outfits again this month! Which of the outfits is your favorite? Ohh mooie outfits! De haarkleur van Ashley van Southern California Belle is heeel tof :D. En ik vind de stijl van Iris van A Dash Of Fash ook super leuk! Dat meisje met dat paarse haar wat een droom! 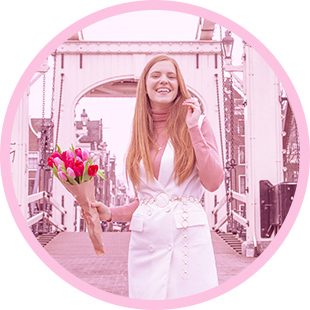 Meteen toegevoegd op blogloving haha! Bedankt voor het delen. Haha, graag gedaan! Supermooi en inspirerend is zij he? !